Uncategories Some Fed, a little Rix, and the BOJ. Some Fed, a little Rix, and the BOJ. "In determining whether it will be appropriate to raise the target range at its next meeting, the Committee will assess progress--both realized and expected--toward its objectives of maximum employment and 2 percent inflation. This assessment will take into account a wide range of information, including measures of labor market conditions, indicators of inflation pressures and inflation expectations, and readings on financial and international developments." One might be excused for suggesting that the above paragraph represents little short of common sense for a central bank that has repeatedly suggested for most of this year that the majority of its members have anticipated raising rates by the next meeting at the latest. OK, perhaps not complete common sense- the last clause of the excerpt does little to disabuse cynics of the notion that the on/off switch to lift-off is hooked up directly to a live feed of the SPX. To be sure, the Fed statement changed in another ways as well; by removing the comment that "recent global economic and financial developments may restrain economic activity somewhat and are likely to put further downward pressure on inflation in the near term", the Fed has also suggested that the on/off switch is also connected to feeds of the Shanghai Composite, USD/BRL, etc. One really has to question the validity of their analytical framework if they can be legitimately concerned about downside risks to inflation because of a bit of market volatility, and then ignore those previously-expressed concerns just a few weeks later. The market reaction was interesting, to say the least. As noted yesterday, a sneaky thematic flow had emerged buying out-of-the-money downside in US fixed income, which in retrospect signaled that either longs were getting nervous or putative shorts were getting itchy trigger fingers. The strip was down several ticks even going into the announcement, and the sell-off in reds and greens after the announcement hit the tape was pretty solid for a statement that was far from a promise of action in the next meeting. Mind you, EDZ6 is still some 20 ticks above its level just before the September meeting, so yesterday's move was more of a normalization than anything else. And so we are left back pricing close to a 50/50 proposition for lift-off in December- maximum uncertainty. Macro Man was unsurprised, therefore, to see equities tumble into negative territory after the announcement, and rather bemused to see them rip thereafter. Yes, he is very constructive on European stocks, but in his worldview uncertainty over Fed tightening is the worst case for US equities. Of course, once excitable afternoon does not a trend make, and as we approach the summer (e.g., all-time) highs in the SPX, Opportunists will no doubt salivate at another chance for a high risk-reward set-up to go short. Speaking of high reward, the dollar looks set to re-engage with its inner bull market. Price action after the Fed announcement was very impressive, with EUR/USD dropping nearly 2 big figures peak-to-trough. Tellingly, the (mostly euro) DXY has broken through the trendline that's defined its consolidation period for much of the year. Although there's been a fair amount of USD buying over the last week since Draghi's press conference, Macro Man would characterize the position as broad but not deep; many people have got some, but few have had the time to build big positions yet. In contrast to much of the price action since March, the EUR/USD decline off of the recent 1.15 high has unfolded in 5 waves, which is usually a good sign that a trend is in force. The macro developments over the last week are all generally supportive of the long VG/short ES position suggested in this space last week. The next catalyst could come as early as today, via the advance Q3 GDP report. The Atlanta Fed GDPNow forecast is below the market's (1.1% vs 1.6%), though was revised up yesterday thanks to a solid preliminary goods trade report. It seems reasonable to expect that any number well out of consensus in either direction will nudge Fed expectations away from 50% in December, with predictable (or not!) implications for asset markets. Obviously, the recent hump was a function of the consumption tax, which has now filtered out of the data...leaving headline inflation close to zero. One small bright spot is that Western-style core inflation (ex food and energy) has turned up, though even that remains woefully short of the 2% target. 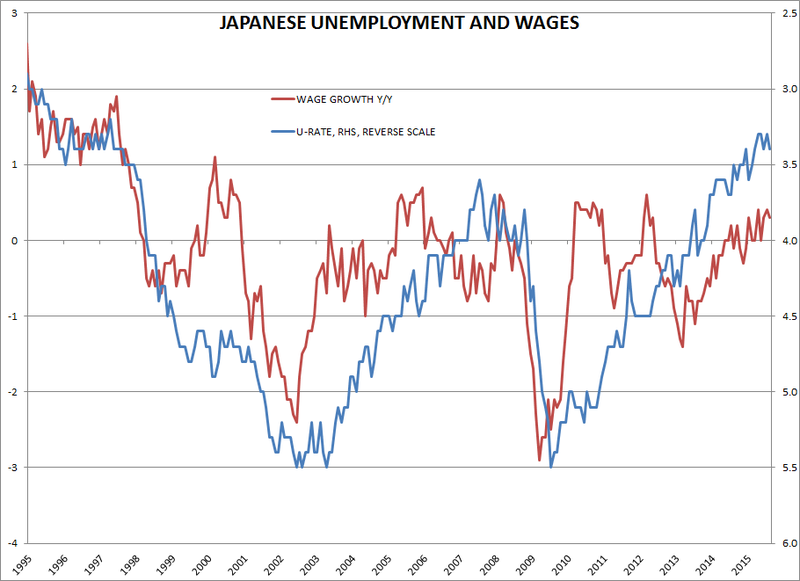 One of the primary transmission mechanisms that Abenomics has tried to employ to effect inflation is wage growth. The good news is that wage growth is near ten-year highs; the bad news is that it's barely over zero. 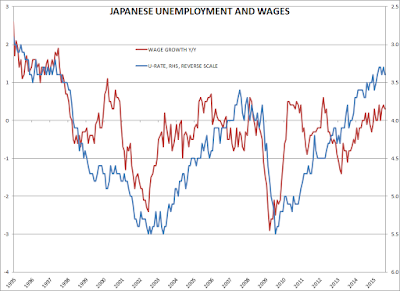 Even in Japan, it seems as if the Phillips curve has flattened. The sharp depreciation of the yen during the Abenomics years has carried into well into undervalued territory according to many conventional measures, including Macro Man's own PPP calculations. 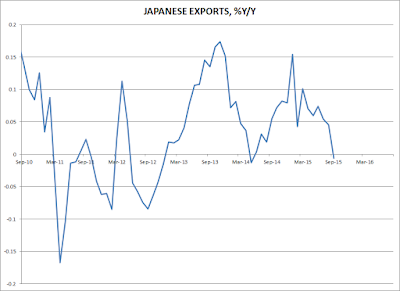 However, you have to say that if the yen is undervalued, it hasn't been reflected in the trade statistics. Yes, the trade balance has improved...but is still in deficit. Of course, this reflects a) the epochal shift in Japan's trade account resulting from the country's energy orientation away from nuclear, and b) the relative dearth of global demand generally. 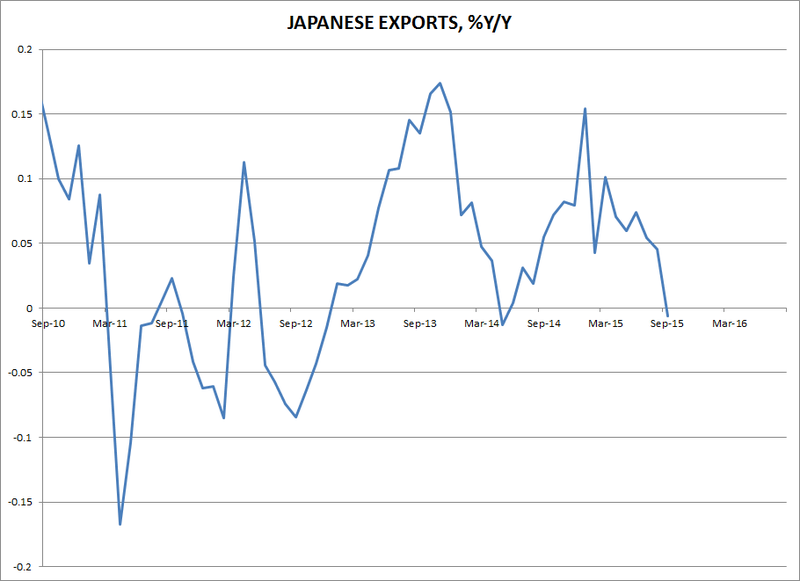 Japan has one of the better export profiles amongst Asian countries....and its exports have fallen to flat y/y. One can certainly argue, therefore, that from a purely economic perspective, further easing is justified. (At least in relation to other countries' policy reaction functions. 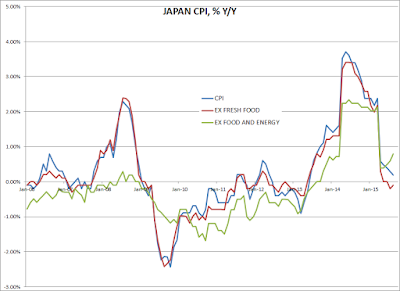 In absolute terms, it is absurd for the BOJ to try to engineer 2% CPI inflation when the weight of domestic and global forces are leaning the other way.) Of course, there are domestic financial stability/market functioning concerns that may give Kuroda and co. pause for thought. However, even if the Fed decides to quit playing beggar-thy-neighbour, everyone else is still doing it. As such, at this juncture it looks like a question of when rather than if the BOJ extends its QQE program, even if today might be a touch early for them. "Just in case" trades look like a decent proposition, therefore, especially for live meetings where relatively little is expected. I think this dollar rally can be faded. 50% seems to me to be too high a probability for a dec hike so I don't see value in DX here. I think there needs to be a major impetus for DX to break out of the range it has been in most of the year. DX is at the threshold and without that impetus I think it will fall back into the range. So I am taking profit on the euro short and going long yen. 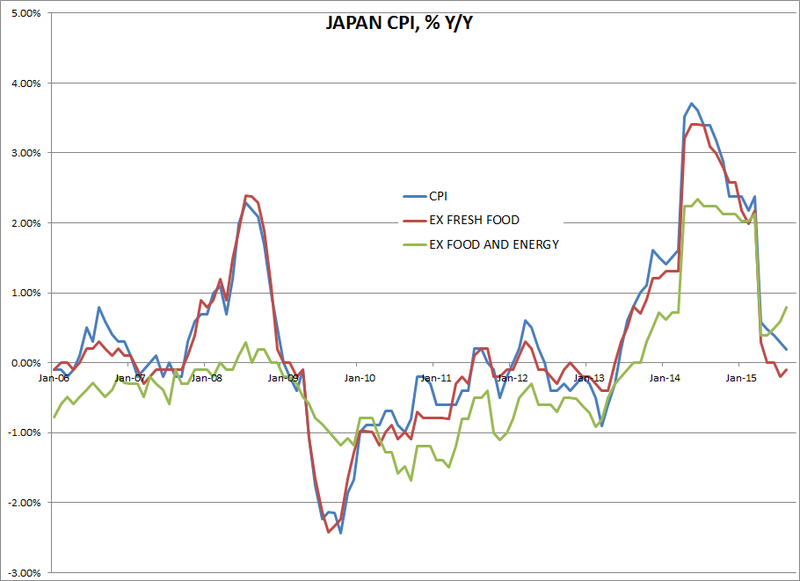 I don't think the BOJ will ease further this week and the pop is worth a play. There is a bit of bias due to the surprise easing last year but I don't think lightning will strike twice there and the probability of an easing is overvalued. Surveys seem to rate it at 30-50% which to me seems way too high. Also if there is a US GDP print disappointment and a bit of risk aversion this would be a bonus for the long yen position. In the medium term, I agree the BOJ will be forced to act but I don't see it at the next meeting. There aren't many clean shirts to play in terms of a DX correction so out of EMFX, comm bloc, euro and JPY, I think longing JPY looks the most enticing over the next few days. FT: I think it's time to reload the shorts. I squared my longs a little early and have been looking for entry points since. My favorite measure for valueing stocks is price to sales and it's deteriorating at the fastest pace in 4 years. I have been a yen bear for some time really because of BoJ, but increasingly feel neutral - its already endured a firing squad, some suicide attacks, and a bunker buster, and refuses to go below 125 (at the extreme) - consensus is more or less squarely in favor of it heading to 150 imminently. It still might, but I'm beginning to think it may be a much bigger, and more painful surprise to people if it went to 1.10 instead, thereby making it fairly valued on PPP type metrics (not a big fan of those BTW). Nico, good to see u back. BBG: "There have been more credit-rating downgrades in developing nations in the first nine months of this year than in the whole of 2014 and the outlook keeps getting gloomier, according to Standard & Poor’s. An economic slowdown and lower commodity prices are to blame, said Diane Vazza, head of S&P’s Global Fixed Income Research Group, in a report Wednesday. S&P cut the ratings for 88 bonds sold by developing countries and companies in the third quarter, including Brazil, Zambia and Ecuador, while raising the grades for 22 securities. That brings the total number of downgrades to 224 this year, compared with the 206 cuts in 2014." "One of two things is going to happen. Either the US economy is or will soon be slowing on the back of already tighter financial conditions. Or the US economy will soon be slowing on the back of future tighter financial conditions as directed by the Federal Reserve. In a worst case scenario, both of these things will happen"
There is no major economy in the world that needs to tap the breaks and the US is no exception. I am happy to see that the Swedes have learned from their past mistake. I wish that the Fed would have as well. Long USD is the right position if you think the Fed will remain on hold. The Fed's all geared up to kick the ball in it's own goal. so much for me thinking vg/es spread about to kick in...seriously what a pile of £%$&&!! The average Swedish mortgage amortization period is 43 years and 140 years for unamortized debt. The proportion of interest-only mortgages is over 70%. With their repo rate already at -35bp (Denmark at -75bp) and Draghi pouring more cold water anyone might guess the room for more "easing" if there were to be a real global recession. That all the capital pours only into real estate seems to be a symptom from these global deflationary drivers. Too much stuff, too much industrial capacity, no real innovation, no real demand growth. As the population increases, the demand created in the basic needs category should be easily absorbed by marginally increasing the utilization of the present day high efficient industrial capacity, thus not creating enough jobs to even keep status quo re employment rates. Maybe humanity should start colonizing more of the solar system and build space ships with warp drives or something to create new demand. Then it could physically absorb and distribute all that excess capacity. I've been long waiting for a decent spike in rates, but it might have more to do with oil bounce and not with the economy on fire at 1.5%. Would love to see 30s at 3.5 and 10s at 2.5% but I don't know. It's hard to be convicted of the durability of the oil rally. I think any decent sized govvie dump is meant to be bought considering the big picture. Last 24 hours have been the most confusing in my trading career. anon - ur not alone - the only thing that explains all the price action simultaneously is the assumption that the fed (and perhaps more importantly, EMs) will get the future it wishes for, as opposed to the one that has been unfolding - weird indeed. Then again, given how big the massacre has been for hedge funds, these moves across asset classes are probably much more driven by positioning than usual. Equities are a lucky asset class in that 99% of the money involved is blissfully unaware of macro till it hits them in the face with a frying pan. Rix? Did you mean Dx? Or were you recalling Graham Rix of the Liam Brady era? Anyway, thanks for evoking the only Arsenal team I ever enjoyed watching. Brady was a magician. as Ye Vol Stayeth Low. Verily, as He Hath Done to LB Last Year. LB: Lol. Made my day. I myself sit on my hands for now. Or I sence money will be lost.